1) Think of someone who has been doing a fantastic job in your classroom lately. 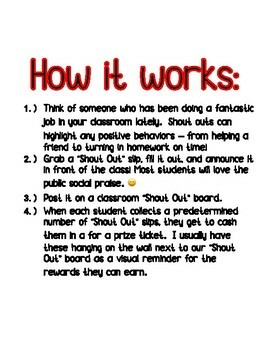 Shout outs can highlight any positive behaviors – from helping a friend to turning in homework on time! 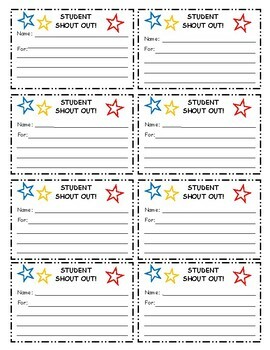 2) Grab a “Shout Out” slip, fill it out, and announce it in front of the class! Most students will love the public social praise. 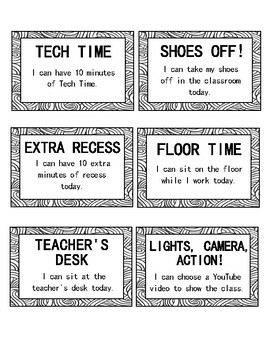 3) Post it on a classroom “Shout Out” board. 4) When each student collects a predetermined number of “Shout Out” slips, they get to cash them in a for a prize ticket. I usually have these hanging on the wall next to our “Shout Out” board as a visual reminder for the rewards they can earn. This is also a great resource to teach students how to highlight other peers’ behavior! 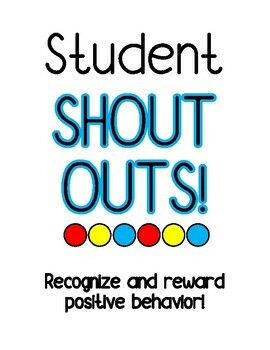 Encourage students to share positive behaviors they have witnessed their classmates portray. My students loved writing slips the entire year! Delivering these positive notes to their peers never got old for them. Includes “Shout Out” slips, prize tickets (print on colored paper for extra fun! ), and blank prize tickets to create your own classroom prizes.